Hoi-Shun Lui received both his Bachelor of Engineering degree with first class honours and PhD degrees in Electrical Engineering from the University of Queensland, Brisbane, Australia in 2003 and 2008 respectively.He received a Diploma in Higher Education from Chalmers University of Technology, Gothenburg, Sweden in 2010. In 2008, Dr. Lui was employed as research fellow at the National University of Singapore working on antenna array problems. From 2009 to 2012, he was first an Assistant Professor and later an Associate Professor (Docent) in Chalmers University of Technology. 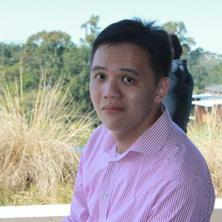 Since 2013, he moved back to UQ where he received a UQ Postdoctoral Research Fellowship. Dr. Lui is the author/co-author of more than 80 articles in referred journals and conference. He is currently the vice chair of the IEEE Queensland Microwave Theory and Techniques (MTT) and Antennas and Propagation (AP) joint chapter. Dr. Lui’s research focuses on fundamental development of novel electromagnetic sensing and imaging techniques for biomedical, as well as defence and surveillance applications. This includes ultra wideband radar techniques for concealed object detection, microwave sensing technique for breast cancer detection, multiple-input multiple-output (MIMO) radar imaging for defence applications, as well as fundamental research in accurate characterization of mutual coupling effects in antenna array and time domain electromagnetic scattering. Dr. Lui is currently developing novel Terahertz sensing techniques for skin imaging, as well as adopting existing microwave radar techniques into terahertz frequency region using Quantum Cascade Laser and laser feedback interferometry. Lui, A.H.S., Shuley, N. V. Z. and Crozier, S. (2005). Hip prosthesis detection based on complex natural resonances. In: Y.T. Zhang, 2005 IEEE Engineering in Medicine and Biology 27th Annual Conference. 27th Annual International Conference of IEEE Engineering in Medicine and Biology Society (EMBC'05), Shanghai, China, (1867-1870). 1-4 September, 2005. Hoi-Shun Lui Radar target recognition based on transient electromagnetic scattering: novel applications of the extinction-pulse technique. Koln, Germany: Lambert Academic Publishing, 2009. Johansson, Markus, Fhager, Andreas, Lui, Hoi-Shun and Persson, Mikael (2011) Comparison between two phase-retrieval methods for electromagnetic source modeling. Progress in Electromagnetic Research B, 30 239-253. Johansson, Markus, Lui, Hoi-Shun and Persson, Mikael (2010) Performance evaluation of phase-angle gradient method for phase retrieval based on low-frequency amplitude-only near-field data. Progress in Electromagnetic Research B, 25 113-130. Lui, Hoi-Shun, Fhager, Andreas and Persson, Mikael (2015). Matching medium for biomedical microwave imaging. In: 2015 International Symposium on Antennas and Propagation (ISAP). International Symposium on Antennas and Propagation (ISAP), Hobart, TAS, Australia, (). 9-12 November 2015. Lui, Hoi-Shun, Fhager, Andreas, Yang, Jian and Persson, Mikael (2013). Characterization and detection of breast cancer using Ultra Wideband polarimetric electromagnetic transients. In: EuCAP 2013 : the 7th European Conference on Antennas and Propagation. 7th European Conference on Antennas and Propagation, EuCAP 2013, Gothenburg, Sweden, (2909-2913). 8 - 12 April 2013. Fayazi, Seyedeh Shaghayegh, Yang, Jian and Lui, Hoi-Shun (2013). UWB SAR imaging of near-field object for industrial process applications. In: EuCAP 2013 : the 7th European Conference on Antennas and Propagation. 7th European Conference on Antennas and Propagation, EuCAP 2013, Gothenburg, Sweden, (2245-2248). 8 - 12 April 2013. Lui, Hoi-Shun, Fhager, Andreas and Persson, Mikael (2012). Microwave breast imaging using different data sets. In: AntennEMB 2012, Stockholm, Sweden, (). 7-8 March 2012. Yang, Jian, Yin, Jungang, Pantaleev, Miroslav, Yu, Yinan, Mc Kelvey, Tomas, Fayazi, Seyedeh S. and Lui, Hoi-Shun (2012). Several new ultra-wideband antenna systems for radio telescopes and industry sensor imaging process. In: Proceedings of the 2012 International Conference on Electromagnetics in Advanced Applications : ICEAA '12 : 14th edition, including EEIS. International Conference on Electromagnetics in Advanced Applications: ICEAA '12, Cape Town South Africa, (1281-1284). 02-07 September 2012. Persson, Mikael, McKelvey, Tomas, Fhager, Andreas, Lui, Hoi-Shun, Shirvany, Yazdan, Chodoroski, Artur, Mahmood, Qaiser, Edelevik, Fredrik, Thordstein, Magnus, Hedström, Anders and Elam, Mikael (2011). Advances in neuro diagnostic based on microwave technology, transcranial magnetic stimulation and EEG source localization. In: Proceedings of the Asia-Pacific Microwave Conference 2011. Asia-Pacific Microwave Conference, Melbourne, Australia, (469-472). 5-8 December 2011. Lui, Hoi-Shun, Fhager, Andreas and Persson, Mikael (2011). Analysis of forward scattering data for microwave breast imaging. In: Proceedings of the Asia-Pacific Microwave Conference 2011. Asia-Pacific Microwave Conference, Melbourne, Australia, (195-198). 5-8 December 2011. Mirzaei, Hamidreza, Hui, Hon Tat and Lui, Hoi-Shun (2010). Numerical determination of nuclear magnetic resonance frequency of the single-qubit operation in Kane's quantum computer. In: Proceedings of the Asia-Pacific Microwave Conference 2010. Asia-Pacific Microwave Conference, Yokohama, Japan, (2172-2175). 7-10 December 2010. Lui, H. S. and Shuley, N. V. (2010). On the polarization response using resonances for target recognition. In: Microwave Conference Proceedings (APMC), 2010 Asia-Pacific. Asia Pacific Microwave Conference 2010, Yokohama, Japan, (1813-1816). 7-10 December, 2010. Lui, Hoi-Shun, Hui, Hon Tat and Persson, Mikael (2010). Preliminary investigations of mutual coupling effect on near-field beam focusing. In: Proceedings of the Asia-Pacific Microwave Conference 2010. Asia-Pacific Microwave Conference, Yokohama, Japan, (1705-1708). 7-10 December 2010. Lui, Hoi-Shun, Aldhubaib, Faisal, Shuley, Nicholas V. and Persson, Mikael (2009). Monitoring subsurface target changes based on cross-polarized wideband scattering. In: European Radar Conference, 2009: EuRAD 2009: Conference Proceedings. European Radar Conference (EuRAD 2009), Rome, Italy, (405-408). 30 September - 2 October 2009. Lui, Hoi-Shun, Aldhubaib, Faisal, Shuley, Nicholas V. and Persson, Mikael (2009). Performance analysis of resonance based radar target recognition with different excitation bandwidth using the E-Pulse technique. In: Proceedings of the 6th European Radar Conference. 2009 European Radar Conference, Rome, Italy, (469-472). 30 September - 2 October 2009. Padhi, Shantanu, Lui, Hoi-Shun, Shuley, Nicholas and Liu, Feng (2008). Detection of a Dielectric Target in a Half-space Using Extinction-pulse (E-pulse) Technique. In: Progress In Electromagnetics Research Symposium Abstracts. Progress In Electromagnetics Research Symposium (PIERS) 2008, Hangzhou, China, (722-722). 24-28 March 2008. Lui, H. and Shuley, N.V. (2007). Detection of concealed metallic targets using the E-Pulse technique. In: Granet, C., Rolph, D., Bird, T.S., Kot, J.S. and Cooray, F.R., Tenth Australian Symposium on Antennas Abstract of Papers and Information. Tenth Australian Symposium on Antennas, Sydney, NSW, (54-54). 14-15 February, 2007. Lui, H. and Shuley, N. (2007). Joint time-frequency analysis of ultra wideband radar signals. In: Wysocki, T. and Wysocki, B., International Conference on Signal Processing and Communication Systems (ICSPCS'2007). International Conference on Signal Processing and Communication Systems (ICSPCS'2007), Gold Coast, Australia, (1-8). 17-19 December, 2007. Lui, H. and Shuley, N.V. (2007). Performance analysis on subsurface target depth detection using E-Pulse technique. In: Iskander, M.F., Proceedings of the 2007 IEEE International Symposium on Antennas and Propagation. 2007 IEEE International Symposium on Antennas and Propagation, Honolulu, Hawaii, (1781-1784). 9-15 June, 2007. Lui, H. and Shuley, N.V. (2007). Time-frequency analysis of ultra wideband electromagnetic transients from radar targets. In: Granet, C., Rolph, D., Bird, T.S., Kot, J.S. and Cooray, F.R., Tenth Australian Symposium on Antennas: Abstract of Papers and Information. Tenth Australian Symposium on Antennas, Sydney, NSW, (39-39). 14-15 February, 2007. Lui, H S, Shuley, N V Z, Padhi, S K and Crozier, S (2006). Detection of hip prothesis depth change using an E-pulse technique. In: R. Vahldieck, Proceedings of Topical Meetings of EMC-Zurich in Singapore 2006, 17th International Zurich Symposium on Electromagnetic Compatibility. EMC-Zurich in Singapore 2006, 17th International Zurich Symposium on Electromagnetic Compatibility, Singapore, (81-84). 27 February - 3 March, 2006. Lui, H S, Shuley, N V Z and Crozier, S (2006). Detection of small changes in a hip prothesis using the E-pulse technique. In: D. McLemore, IEEE Antennas and Propagation Society International Symposium 2006. IEEE Antennas and Propagation Society International Symposium 2006, Albuquerque, USA, (2195-2198). 9-14 July, 2006. Lui, H S and Shuley, N V Z (2006). Resonance based radar target identification with multiple polarizations. In: D. McLemore, IEEE Antennas and Propagation Society International Symposium 2006. IEEE Antennas and Propagation Society International Symposium 2006, Albuquerque, USA, (3259-3262). 9-14 July, 2006. Padhi, S K, Shuley, N V Z and Lui, H. A. (2006). Resonance behavior of a dielectric target in a half-space using the CNR (Complex Natural Resonance) method. In: D. McLemore, IEEE Antennas and Propagation Society International Symposium 2006. IEEE Antennas and Propagation Society International Symposium 2006, Albuquerque, USA, (715-718). 9-14 July, 2006. Padhi, S K, Shuley, N V Z, Lui, H S and Crozier, S (2006). Time domain characterization of dielectric target in a half space using complex natural resonance method. In: R. Vahldieck, Proceedings of Topical Meetings of EMC-Zurich in Singapore 2006, 17th International Zurich Symposium on Electromagnetic Compatibility. EMC-Zurich in Singapore 2006, 17th International Zurich Symposium on Electromagnetic Compatibility, Singapore, (109-112). 27 February - 3 March, 2006. Lui, A.H.S. and Shuley, N. V. Z. (2005). Resonance based radar target detection with multiple data sets. In: T.S. Bird, 9th Australian Symposium on Antennas. 9th Australian Symposium on Antennas, Sydney, Australia, (67-67). 16-17 February 2005. Khessal, Nadir Ould, Naing, Maung Yan, Hwee, Eric Ng Boon, Oo, Pyi Soe and Antony, Lui Hoi Shun (2000). Vision-based autonomous soccer robots. In: 2000 Tencon Proceedings : Intelligent Systems and Technologies for the New Millennium. 10th International IEEE Tencon Conference, Kuala Lumpur Malaysia, (207-212). 24-27 September 2000. Antony Lui (2008). Radar Target Recognition based on Ultra Wideband Transient Electromagnetic Scattering PhD Thesis, School of Information Tech & Elec Engineering, The University of Queensland.